In case you don’t know, Doug Jones played the thing the with the hands in Pan’s Labyrinth, which I dubbed the scariest thing in the scariest movie. Some other terrifying thing he’s played includes: the scary zombie at the end of Quarantine, the ice cream man with the arms in Legion, and Billy Butcher in Hocus Pocus. (Okay, Billy Butcher isn’t scary but he is neat.) He’s also played Abe in Hellboy. So anyway, Doug Jones is awesome. And that’s my favorite tweet ever. Rick Springfield is playing at the Mayo Civic Center next week, and I’m debating on whether or not we should go see him. I love Rick Springfield. But… well. I guess it’s not much of a debate. I don’t really have a “con” for not seeing him. I mean, it’s flippin Rick Springfield, right? I have an actual album (as in vinyl) of Working Class Dog. That album came out 3 years before I was born. Also in fun news – James Franco was nominated for an Oscar. What fun for James Franco! He’s like the most fascinating person in the whole world. I literally have no clue what he’s going to do next. Ever. And I love that. Today, I did a phone interview with USA Today. They said it should be out sometime next week. I mostly talk about publishing and ebooks, but it’s fun. So if you’re into things that I say, you might enjoying checking that out. And I forgot to post this the other day. 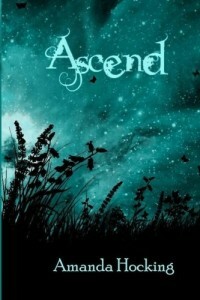 I’m having a giveaway at Goodreads for a signed copy of Ascend. To enter, click on the link on do what Goodreads says. Giveaway ends January 30, 2011. I also saw Rick Springfield with Corey Hart when I was fourteen. It was my first concert ever. I had so much fun! I remember that on twitter haha, you were so happy!!!! And he’s so good at scary!!! especially the ice cream man in legion, *shivers* I won’t look at another ice cream man the same way. I would be staring, waiting for a long face and spidery limbs! I will be looking through USA Today for your interview. This is awesome!! I am very glad I got a Nook for Christmas because I was able to find you. So far I have only read The Trylle Trilogy but I am in the process of reading all. BTW….ignore all those comments about Ascend. I thought it ended great. I was hoping for Finn but I think she ended up with who was right for her. @gniz I love that episode of “30 Rock.” If it turned Franco was really dating a pillow, I wouldn’t be surprised. And Rick Springfrield is awesome! Did anybody see him playing himself on “Californication?” That was a good time. Congrats on the USA Today interview!! You deserve it! As for Rick Springfield…he played last year at our Junior League of Dallas Casino Night and was HORRIBLE!!! I looovvveeee him and was uber excited that we got him to play the event, but was so sad afterwards. Hopefully he’s better this year! I saw Rick Springfield in concert in Iowa in the early 80s. I would have been 11 or 12. That and New Edition (mid 80s) are the only two concerts I’ve ever been to. Awesome on the USA Today interview! One of James Franco’s best moments imo was on 30 Rock when he plays himself. He instigates a phony celebrity relationship with Jenna so that the paparazzi won’t realize his actual relationship with Kamika, a Japanese pillow doll. Absolutely hysterical episode and he goes all the way with it.